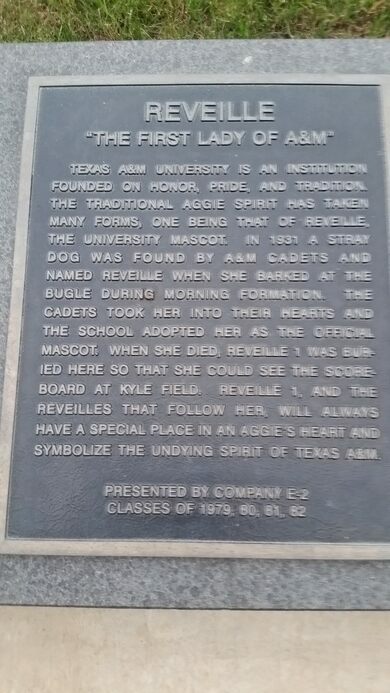 Few college mascots are treated as royally as Reveille, the “first lady” of Texas A&M University. Not only is she officially the highest ranking member of the university’s Corps of Cadets, she has the rank of a Five-Star General. 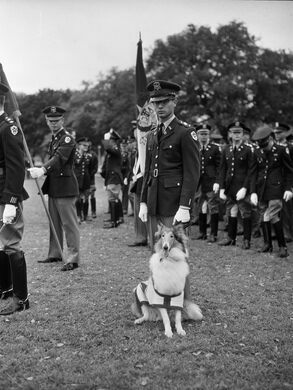 The first Reveille was a stray mutt rescued by some A&M cadets (after they hit her with their car), and brought back to campus. After spontaneously leading the marching band onto field, she was named the official mascot. When she died in 1944, she was honored with a formal military funeral and interred at the north entrance of the football stadium. Thousands of people have attended each of the military funerals for deceased Reveilles to the sound of Taps and 21-gun salutes. Reveille I, like all Reveilles subsequent, still gets to participate in A&M football from a burial ground at the north entrance of the stadium. 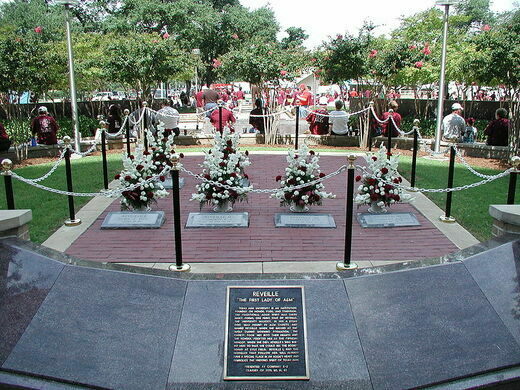 The dog cemetery once had a view of Kyle Field’s scoreboard, but renovations and moving of the grave sites blocked the view and a miniature scoreboard had to be installed at the new location. The relocation itself caused an uproar with Aggies, one comparing it to moving the Tomb of the Unknown Soldier in Arlington Cemetery. All the dogs are buried with their heads and paws pointed towards the stadium, so that in death “they can always watch the Aggies outscore their opponent on the field” (although there are games in recent memory that presumably made the dogs cover their sockets with skeletal paws). The current Reveille VIII, like all Reveilles since Reveille III, is a well-groomed, purebred collie. All manner of traditions and rules have developed around the dog, including that if she barks in a class it is dismissed, that she can take any cadet’s bed and force the student to sleep on the floor, and that she must be addressed as “Miss Rev, ma’am.” Reveille also has access to all campus buildings and attends classes, and any social activities including dates, with the sophomore cadet assigned as her carer. Parking is limited. 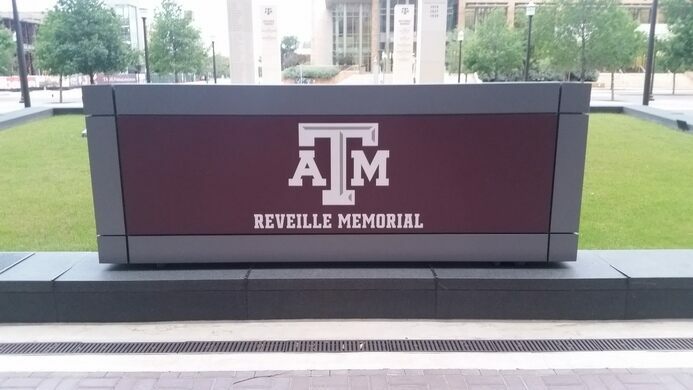 Reveille Memorial is located on the north side of Kyle Field.